A faculty member in the Department of Pediatrics has received the Silver Creator Award from YouTube. 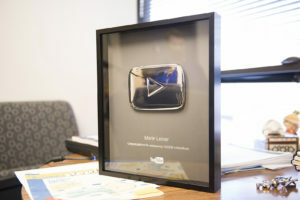 The award is issued when a YouTube channel reaches 100,000 subscribers. Research Professor Marie Leiner, Ph.D., uses YouTube to share cartoons she creates for children. But they aren’t just for entertainment — they’re educational and specifically designed to solve social problems in children and instill good behavior. Marie Leiner, Ph.D., Department of Pediatrics, has received YouTube’s Silver Creator Award for her educational cartoons. The cartoons apply social learning, moral disengagement, and digital narrative theories to promote good behavior in children. Her most popular channel, which features the cartoons in Spanish, has nearly 132,000 subscribers and more than 82 million views. As part of the award, Leiner received a personal note from the CEO of YouTube, Susan Wojcicki. Each of Leiner’s episodes feature a little girl named Didi or a boy named Pepin that turn into superheroes when they see children misbehaving, like bullying, lying, or stealing. The cartoons apply social learning, moral disengagement, and digital narrative theories to promote good behavior. The theories work by having children observe a particular behavior and then connecting that behavior to subsequent rewards or consequences. Leiner is the cartoons’ producer and scriptwriter, and is the voice of several characters, but receives assistance with the animation. These cartoons are part of a larger research project to study mental health communication.